Ingredients: Will Ferrell, Zach Galifianakis, Jason Sudeikis, Brian Cox, Dan Aykroyd, John Lithgow, Dylan McDermott, Sarah Baker, Katherine LaNasa, Karen Maruyama and Jack McBrayer. Directed by Jay Roach. Run time: 85 minutes. Rated: R.
At First Bite: The wife had Election Day off, so she decided she could stay out a little later the night before. Normally, she wouldn't suggest a movie, but we have two movie theaters/restaurants in the area: Asheville Pizza & Brewing Company and Cinebarre. HOPE SPRINGS and TED were playing at the former. I suggested THE CAMPAIGN because I thought it would be fun to see the night before Election Day, plus it was a shorter drive. Democratic Congressman Cam Brady (Ferrell) is running for his fifth term in NC's 14th District. He's running unopposed, but his campaign takes a serious hit when he accidentally leaves a racy message intended for his mistress on a constituent's answering machine. Two dirty businessman, the Motch brothers (Aykroyd and Lithgow), urge Marty Huggins (Galifianakis) to run against Brady. Things get shady. Then, things get scandalous. Tough to Swallow: The H. Ross Perot quote at the beginning of the film says he was a presidential candidate in 1988. He didn't run until 1992. The quote is from 1996, which was the second time he ran for president. I still don't really understand why Marty is coerced to run for Congress. Cam was running unopposed. The Motch brothers could have just helped Cam reinvent his campaign. Something to Chew On: John Goodman has a cameo. Marty's car has the license plate GEN-0101, which is a biblical reference. 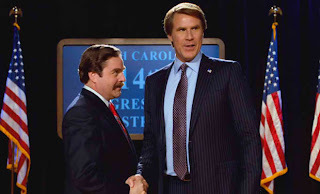 Aftertaste: Over the years (2005-2009), I had grown tired of Will Ferrell. But, in 2010, he redeemed himself with THE OTHER GUYS and MEGAMIND (I've yet to see EVERYTHING MUST GO). Unfortunately, this is one of those Ferrell movies where he seems to play the same character he always plays. The schtick is old. Even Galifianakis's Marty is basically a cut-and-paste version of his Seth character from his standup routines. The political jabs toward John Edwards and the Koch brothers just couldn't make up for the lack of laughs. The humor is crude, which is fine by me, but I thought it was going to be much funnier. The funniest part of the movie, much like in TALLADEGA NIGHTS: THE BALLAD OF RICKY BOBBY, is the dinner scene involving the Huggins family. Well, I take that back. The funniest part is probably the Dermot Mulroney reference during the end credits scene. Maybe this is a film that gets better with multiple viewings. Heck, I gave ANCHORMAN: THE LEGEND OF RON BURGUNDY a measly 2.5 stars when I saw it in the theater, and now it's a flick I'll watch every time it's on television. But, based on first impressions, it just doesn't get my vote. "I thought it was funny, but I got a little bored." -- My wife.